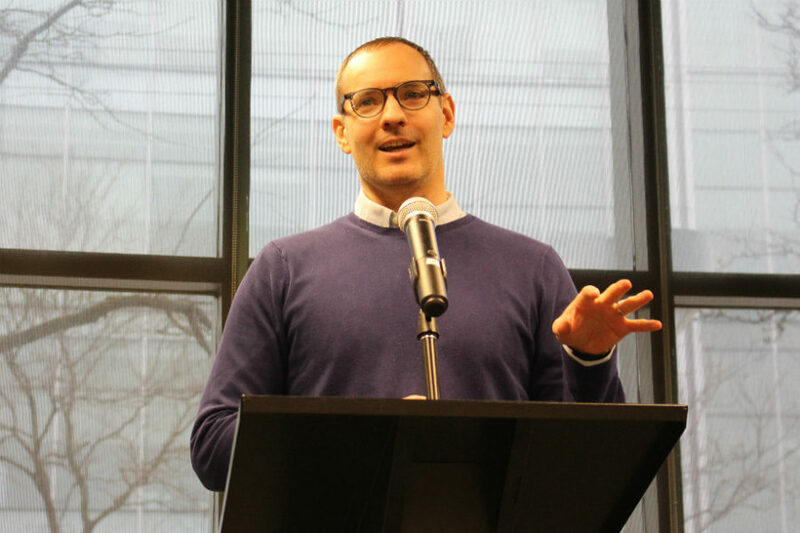 Most fake news creators are doing it for the money rather than for ideological reasons, a leading authority on fake news and verification said at the annual Ryerson School of Journalism Atkinson lecture. Craig Silverman, the media editor for BuzzFeed News, said two Canadian teenagers who create fake news stories have earned as much as $10,000 a month from advertising after their fabricated accounts about Prime Minister Justin Trudeau spread on the Internet. “Most of the people I’ve encountered tend to be small operators,” he told the crowd of mostly journalism students. “Sometimes they’ll try to pretend that they’re exposing how gullible people are, like they have some higher mission, but really, they do it for money and that’s why they exist. “The more eyeballs they get on a particular URL, the more money they earn” from advertisements placed on their sites by Google AdSense and other services they’ve signed up for, he said. In his reporting, Silverman has exposed teenagers in Veles, Macedonia who wrote fake news about Donald Trump because it was, as the teenagers told him, an “easy way to make money.” Among the fake news on the Macedonian sites was a claim that the pope had endorsed Trump for president. This story was considered one of the Macedonian creators’ five most successful posts, he reported. Silverman’s work as the founder of real-time rumour tracker, Emergent, and as editor of the Verification Handbook, has helped journalists all over the world sort fact from fiction on the Internet. During the U.S. presidential election, he said, the number of fake news sites and stories far exceeded anything he’d seen before. In Canada, he added, the economic opportunity for fake news creators is somewhat limited because the market is smaller and the economic returns are smaller. He suggested that ideologically motivated fake news, therefore, may play a bigger role in the Canadian context. Fake news stories rely on viral hits as they “don’t have a consistent audience that keeps coming back,” he added, so they fare best on platforms such as Facebook, where there’s a potential for lots of shares. Silverman said, however, that fake news on social media platforms is just one contributor to the “ecosystem of misinformation.” Others include official sources of propaganda, hoaxsters, “unintentional propagators” who inadvertently spread false information and “malicious propagators” who set out to deliberately mislead. News websites staffed by journalists who don’t properly verify information also contribute to the spread of fake news, he said. The problem is compounded, he added, by an overall decline of public trust in the mainstream media and a growing tendency to rely on information posted by friends and family on Facebook – including information that may not be true. Following the U.S. election in November, Silverman’s story documenting how the top-performing fake election news stories on Facebook generated more shares, reactions and comments than the top stories from major news organizations reverberated around the world. To maximize those clicks and shares, he said, the purveyors of fake news target two human psychological behaviours: our desire to consume information that aligns with our own beliefs and our desire to make sense of information in situations of uncertainty. “Anything that tells us what we want to hear or tells us what we want to believe – there’s actually a physiological reaction that makes us feel good about it,” he said. “In a world where Facebook exists, you take action with likes, reactions, comments and shares. And when we encounter information that we disagree with – that goes against what we think – we tend to reject it. “The other thing is that when there’s a lack of information – when there’s a dangerous scenario –rumours naturally start to come out because as humans we’re trying to figure out what’s actually going on…People want to fill in the gaps and if someone tells you something that sort of makes sense, you might accept that information” without questioning whether it is true. Algorithms, he said, exacerbate the problem: “The more you engage with certain types of content, the more you will be shown that as well. So, if you see this stuff and you react strongly to it, you will probably be fed more of it [by algorithms] over time. Silverman said that journalists are not immune from the human inclination to believe information that aligns with what they believe and ignore or downplay information that conflicts with their worldview. In this ear of an “abundance of information” and a “scarcity of attention,” he added, journalists can learn some things from the authors of fake news. “A scarcity of attention means trying to get people’s attention is that much harder,” he said. “So, thinking about how you go for their emotion and thinking about how you cut through – [these are] some of the things that the [creators of] fake news do. The annual Atkinson Lecture at the Ryerson School of Journalism is made possible by an Atkinson Charitable Foundation endowment in honour of former Toronto Star publisher Joseph E. Atkinson.